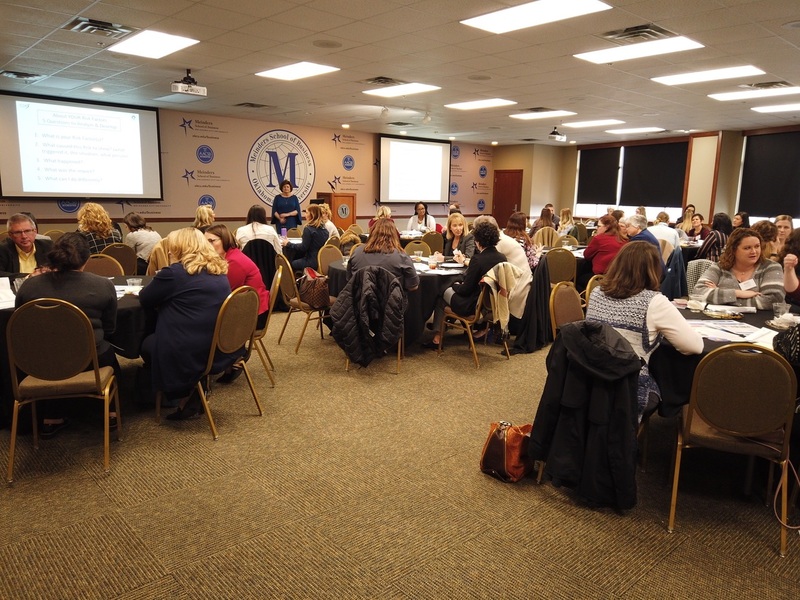 On January 17th, I presented our research and solutions for ending the glass ceiling to Women in Energy Oklahoma City at a luncheon at the OCU Meinder’s School of Business. The workshop was energizing, rewarding, and fun. The energy industry is where I cut my teeth many years ago (in HR at a shipyard, coal mine and pipeline), so I feel back at home when working with clients in this sector. At the session, the Women in Energy participants were engaged and interested – I could see that the insights were resonating. There were about 85 women and two men from a variety of organizations such as Chesapeake Energy, Devon Energy, OGE, Pipeline Equipment, Inc. and more. Once I went through much of the core presentation about our research findings showing how women’s inherent personality-based risk factors are holding them back, there were hard hitting questions from the audience. In fact, some even shared insights about their own personality-based risk situations with the group at large. In break out table groups, the participants discussed their own suspected risks and the room was abuzz with everyone opening up and sharing their own risk stories. Interestingly, even though this was a new concept to them, identifying their own risk factors, and understanding the impact, resonated. Many committed to next steps to continue the dialogue with their colleagues, peers and others. One young professional talked with me afterwards and said she could see how she held herself back at times by waiting until she thought everything was perfect. She committed to not letting that happen anymore. She hadn’t realized this was a trap she routinely fell into. Others came to me with stories of their worrying when they felt pressure or when being pushed to make quick decisions. They appreciated a new way of framing what was going on with them. Several expressed hope and confidence that they were able to begin to recognize their suspected risks so that they could work on personal development strategies and different in-the-moment tactics. Many of the participants have requested to connect with me on LinkedIn and about half of the group want to join our network of women who are making the glass ceiling history. So, in all, this was a great session! Thank you to Women in Energy – Oklahoma City for joining me in ending the glass ceiling within a decade!